Littlewoods at 1 month old! March makes very clear that we had a baby! Our co-payment for Littlewoods’ birth as well as a few doctor’s appointments and her birth certificates are all reflected in March’s spending. While we frugalize nearly every aspect of child-rearing–from sourcing all used clothing, furniture, and baby accoutrements to creating simple, inexpensive holiday celebrations–there are some immutable costs of having a baby (such as buying copies of their birth certificates!). I love that most of Littlewoods’ stuff–her crib, her clothes, my infant carrier, etc–is on at least its fourth child. Friends and family handed things down to us before Babywoods was born (and I bought some things at garage sales and thrift stores) and it lives on for Littlewoods! I’m already lining up friends interested in taking these hand-me-downs from us after Littlewoods is done with them. I foisted off gave away a bunch of maternity clothes this past weekend to a friend who is pregnant and am delighted to continue the cycle of sharing and passing along maternity and baby things. 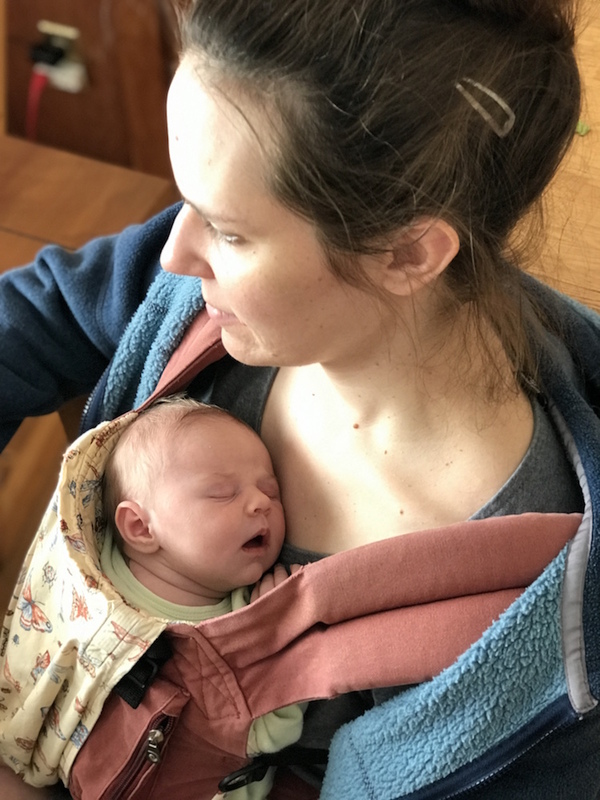 Those maternity clothes have been through AT LEAST five different pregnancies–likely even more!–and I love that so many of us have embraced the philosophy of not buying new stuff and instead sharing and passing around our things. I also recently donated two huge bags of baby clothes that we no longer need to a kids clothing swap where I was able to find some bigger sizes for Babywoods for the coming months. Kids cycle through toys, clothes, and stuff at such a rapid rate that it is absolutely not worth it to buy new. Looking around our house, there are precious few brand new things for our kids. We did have to buy a new infant carseat for Littlewoods as Babywoods’ hand-me-down seat was expired, but we found one at Wal-Mart for 50% off! Hooray! Still bummed we had to buy new, but I wasn’t able to find a hand-me-down that wasn’t expired. In addition to the obvious cost savings of hand-me-downs and used things, I also love the environmental benefit. 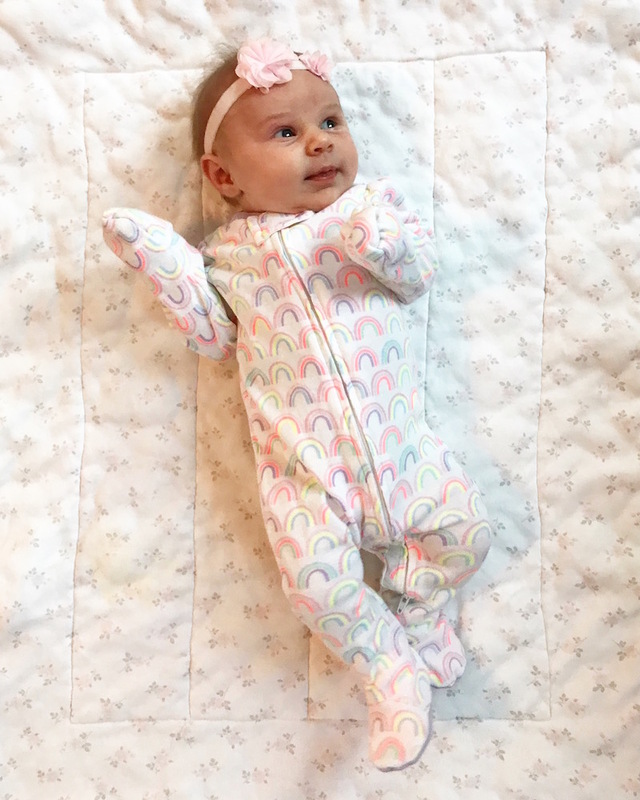 By taking used things otherwise destined for a landfill, and then passing them along instead of throwing them out, we’re circumventing the embodied costs of buying new and keeping perfectly good baby things in circulation. It’s also true that sourcing things used eliminates the temptation to overanalyze every single purchase and become overwhelmed by choice (research shows that more choices do not make us happier!). 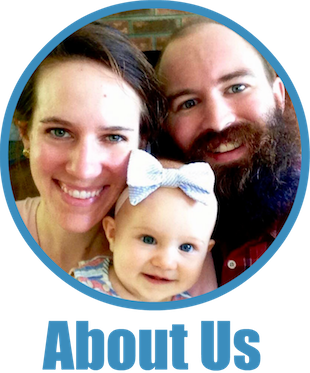 I’ve written extensively on the topic of used stuff, and used baby/kid stuff in particular, and I’m reminded of the compounding savings of used things anytime we have a major life change and are able to avoid spending a ton of money. It’s true, I’m getting older. I turned 34 in March and Mr. FW took me out to lunch to celebrate! My fabulous in-laws were visiting and very kindly watched the girls for us while we had a lovely little date. We went to Worthy Burger, a local establishment, and feasted on organic grass-fed burgers (made with beef raised by our neighbors), truffle fries, and local craft beers (full disclosure: I had two. It’s my birthday and, for once, I’m not pregnant!!!!!). We then went in search of a new local coffee shop, only to discover it hasn’t had its grand opening yet. Continuing our hunt, we found a grocery store selling coffee and cupcakes with a little “cafe” (cafe being a charitable word for a table and chairs in their front entryway). Perfect! Mr. FW and I don’t exchange gifts or cards for birthdays and holidays since we’d much rather put that money towards shared experiences–such as lunch and coffee out on the town. I also don’t need more stuff in my life as I’m trying (so hard) to be more minimalist in the things I own and surround myself with at home. Less stuff = less stress (as I discovered during my manic pregnancy decluttering episode earlier this year… ). I know that gift giving is a source of expensive drama for many folks and so I have a number of resources that discuss various different frugal approaches to gift giving. Not giving gifts isn’t for everyone and there’s often a happy middle ground to reach between massive consumerism and a total absence of gifts. 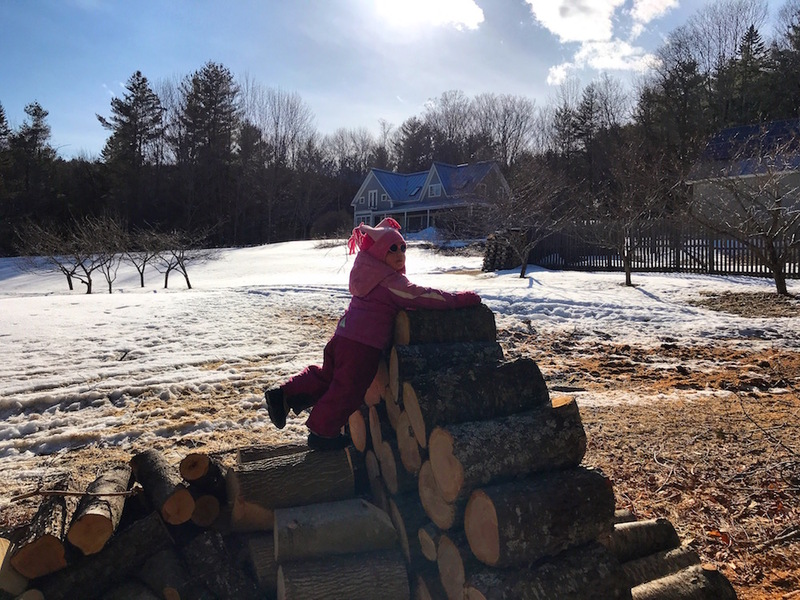 Despite it being March, a month you might normally associate with–ahem–spring, we continue our snow-covered existence up here in Vermont and needed a few snow-related items. Chiefly, the snow scrapers for our cars keep breaking. All the time. I don’t think we’re particularly rough on them (doesn’t everyone joust with their snow scrapers? ), yet they snap with regularity. We also bought these new wiper blades for our Prius as the Bosch icon blades we bought last year shattered in the cold weather. Boo! Again, really wish this stuff would last longer. For stuff like wiper blades that typically can’t be sourced used, I’m a fan of trying to buy things that are not at the top of the market, but that aren’t the very cheapest either. I’d prefer to spend more in an effort to create less waste and hopefully avoid needing to continually replace them. Preschool for Babywoods $240.00 Babywoods goes to preschool two mornings a week and loves it! Household supplies $160.94 Exciting things like toilet paper, dental floss, shampoo, dish soap, and more! Mrs. FW’s birthday lunch! $54.19 Burgers, fries, and beers oh my! Snow Broom $34.95 We bought this snow broom to replace the cheap one we bought just last fall which broke. Wiper blades for Prius $32.10 Wiper blades for our Prius after the Bosch icon blades we bought last year broke. Snow. snow. and more snow. Here in Minnesota, we’re awaiting another dumping this weekend, when it should be in the upper 50s! D’oh. I’m glad you got to enjoy your birthday. I remember how Mrs. Cubert let her hair down too after our twins were born. We still exchange birthday gifts, but they typically qualify as “useful” and aren’t extravagant. Wow, you’ve been busy! And a belated Happy Birthday! Our March was pretty good except for the snow and a few expenses related to a trip Mrs. Freaky Frugal and I are planning to the UK. Today it’s supposed to go over 80 degrees here in Philly! Go figure. We’re also giant fans of Rewards Credit Cards. Aww Littlewoods is so cute! Congratulations to you and your family! I just got a bag full of maternity clothes from my neighbour the other day. I offered to pay, but she declined. I was really touched by her gesture. It’s going to be 84 in DC today, already too warm for me. I’ll take some of that snow!! What /how do you pay for Health Insurance? Since it doesn’t show up in the monthly expense report, I’m guessing it comes free through Mr. FW’s work. My own health insurance through work isn’t free, but it isn’t expensive. My husband’s insurance through work is free for the family. (HDHP + HSA). Of course anything beyond preventative (I’m look at YOU ear infections!) we cover out of pocket or from the HSA. Allow me to wish you a belated happy birthday! I heartily second the statement that babies outgrow things so quickly that it’s not worth it to buy toys / clothes / stuff new. Definitely been our experience as well. Kudos on obtaining so much used. 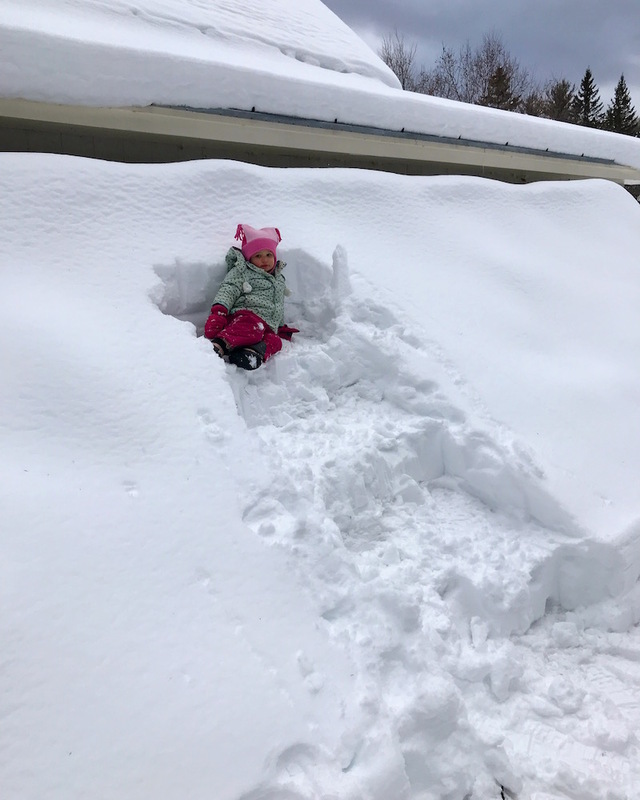 Despite our best intentions, our recent child-rearing adventure has been far less minimalist than we initially planned. This is in large part due to the fact that giving material gifts is the primary love language of my wife’s family. We’ve had several conversations with them on this point and have attempted to offer experiences as gift-giving alternatives, but the frequent visits from Grandma are still often accompanied by a handful of new miscellaneous gifts / clothes / stuff. While we completely recognize that this “too much stuff!”is very much a “first world” problem which we’re blessed to have rather than the alternative of being in need of baby items, it’s been a source of stress for us all the same. Learning to pick our battles and roll with the punches, though. Grandmas are going to be Grandmas! On our part, it’s become a never-ending effort to purge and find ways to re-gift the unnecessary items to those who can better use them. As a believer in saving not only money but also the environment, I’m impressed with your low electric bill! I thought we were doing fairly well in that department (LED bulbs throughout house, smart power strips, etc. ), but our average bill is still $20-25 higher than yours. My plans to replace our electric water heater with a tankless natural gas unit in near future should make up most of this difference. Jinkies, I’m jealous of that deductible! I had surgery last month and had to pay $900 just to be seen – and I’m sure I’ll get a $3,000 bill soon (not an exaggeration unfortunately). I’m hoping April will be an even better month, but with hubby switching jobs next week, we’ll see! I love the environmentally friendly aspect of reusing items. It’s kind of sad that the trend to find reusable things is a “new thing.” How wasteful and spoiled our culture has become! Our grandparents did this out of necessity and did just fine. Now, we all have the chance to save money and prevent waste by buying used and taking advantage of items that aren’t one-time-use. What’s better for many of us is that we can benefit by saving the difference. I’m really glad movements like minimalism, zero-waste and small living are bringing us all back to intentional living again. 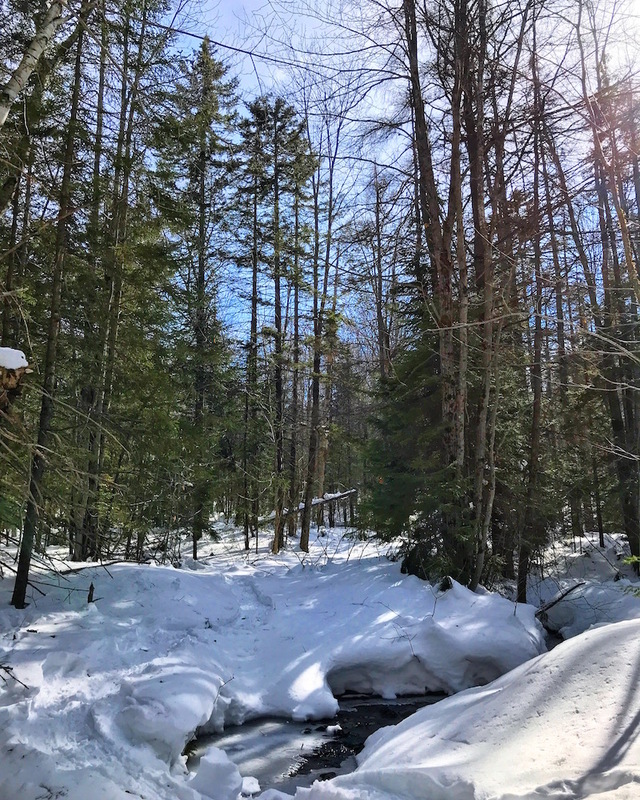 I did some skiing up in Vermont in March and that snow you’re talking about made it wonderful. I was up north at Smugglers and Sugarbush so I think you ended up with even more snow then they did. Skiing may be the least frugal hobby out there. I don’t really care though. I really love it and think it’s super important to spend on the stuff that makes you the happiest. I do my best to plan ahead and keep the costs in check though. Nice job keeping your costs under control even with the new snow brush. The birth of our son last year cost much more than your copay. Love all of your spending avoidances and practical ways to be economically independent! Just a reminder to readers, however – baby items such as cribs and car seats should not be recycled year after year – there exist safety issues with pre-used cribs and car sears and manufacturers are required to improve safety features . A good deal is a good deal as long as it is safe for babies! I didn’t know 47 hours of labor was possible! Wow! I keep getting bummed that we keep getting random snow storms over here, but then I’ll check out your Instagram feed and think, “Eh, I guess we don’t have it so bad.” Ha ha. The snow will melt for us all eventually, though! I’m having a baby too in a few months (also my second), and it’s amazing how much less stress there is this time around because we already have everything we need from our first! I’m a little nervous to see the final hospital bill (it won’t be as low as your co-pay, for sure! ), but we set aside money from our tax return towards that, so hopefully it won’t be too astronomically high (our first kid cost us $6000 out of pocket…and I didn’t even get an epidural!). What an adorable picture of Littlewoods! She and Babywoods are going to be quite the team, I can tell. I’m jealous of your insurance, too. Thirty-two years ago, we had to pay $1500 after insurance for our daughter’s birth, and it was a normal birth, getting us out of the hospital in 48 hours. I was a little down that our monthly expenses seemed so high compared to yours, until I realized my budget included all kinds of saving up for yearly and bi-yearly bills, Christmas, taxes, etc. Once I removed those, I saw we weren’t doing so badly on just plain spending, but there’s room for improvement. That’s why I keep reading blogs like these – they keep me motivated. Boo on the wipers and snow broom. That makes me so frustrated when things like that happen. New reader here, recommended by my enthusiastic older daughter. Noting your co-pay for Littlewoods, I remembered when my second daughter was born in 1974. Multi-purpose credit cards were new then (we had a MasterCard), and when I checked out of the hospital, I used it. I remember saying to the clerk, “I can’t believe I just had a baby and I’m saying ‘Charge it, please. 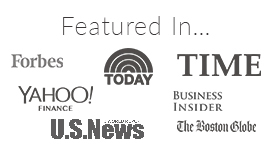 '” Thanks SOOOO much for these blog posts! I read every one avidly, and I’m learning so much! Happy Birthday! What a bang up year so far, birthing a child and a book. 🙂 Wishing you another year of fabulous and frugal. The Snow-Showathon sounds so interesting! Are you or Mr. Frugalwoods participating? March for me was expensive vet bills and property tax. A pretty expensive month but the new (more expensive) prescription food will hopefully prevent further issues for my cat. If another emergency issue happens though, I will go to a different emergency vet that isn’t as expensive and about the same distance from me. I just wasn’t able to research that at 5:00 am on a Sunday. I am also appealing my property value with the state for next tax year. So while not a great month financially, I am taking steps to improve it going forward. My March was a little more expensive, I had to pay for my son’s track fees and meet with a lawyer about my pending lay off (over $300 for 50 minutes!) and also went skiing with my youngest for one day (not cheap). It is easy to forget how good my insurance is through my work. We paid $0.00 out of pocket for the birth of our son. It was a huge blessing to know we didn’t need to pay money for that since we did have other purchases to take care of, like the birth certificates. Thinking I was ahead of the curve – I dare to say I’m more frugal than my god daughter – illness can really take you for a loop. I have excellent insurance and Medicare. I’ve never been in a hospital except to have babies. Then, out of the blue, my doc discovered a congenital heart defect that is only showing up now. Won’t go into all the boring details but it’s going to cost – no matter how careful I’ve been – it’s going to cost. And, so now, I try to figure what else I can do. I certainly do not want to take out a second mortgage and even though I’m still working (pastor and teach) I’m not sure I’m going to come out of this intact financially. Just something to think about – healthcare is NOT cheap and you may think you’re covered – read the fine print! How do you keep your electricity so low?! Happy belated birthday! That’s so great that she loves daycare. We are slowly trying to figure out what class or program we want to put our son in next school year. Thinking about the cost is not exciting, but everything else is! Congratulations on your sweet Littlewoods…precious. Have you considered a reusable coffee filter to eliminate the cost and trash of the paper ones? I got one years ago and use it every day…doesn’t show any signs of giving up the ghost. This may be a really silly question, but how does a car seat expire? It’s a shame, especially if it hasn’t been in any accidents, to not be able to reuse it, isn’t it. Frugal hack: We have a pair of those snow brooms that we got for free because Margie was working in the auto industry and there were a bunch of extras in her office. They use them on the car lots. As for snapping ice scrapers, we have short ones with brass blades. They cost a few bucks on Amazon and last forever. And speaking of wiper blades, uh oh, I just ordered a Bosch icon blade! Hopefully it lasts. Do you have solar panels? We have saved a ton with ours. Happy Birthday! We share a birthday month, I turned 30 and we visited my favorite brewery for a few pints and got to bring our own hummus, veggies, and chips snack! Congrats again on Littlewoods (and no longer being pregnant)! We have beautiful weather here in western Carolina. Monday, however, will bring snow again! Littlewoods is so cute! Congratulations again! 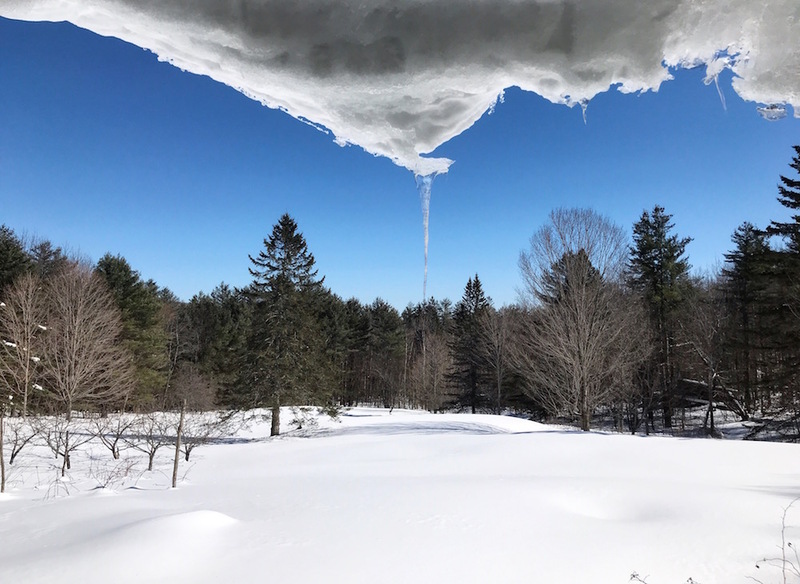 Mid April and we’re Still looking at snow here in Massachusetts. We don’t have problems with our snow scrapers but we lose at least one shovel every winter. May have to invest in something more heavy duty if these winters continue to throw this much snow at us. In regard to wiper blades, they generally need to be replaced 1-2 times a year. In extreme temps and/or vehicle outside all the time, they may only last 3 months. If the vehicle is garaged, they may last 2 years or more depending on use. Actual use longevity can vary depending on use, conditions, care, and quality. It is what it is. We live in Michigan with two of our cars out all year. We rarely replace blades. Maybe every 5 years or so. If blades start to “skip”areas on your windshield, you can bend them, or you can run some fine-gauge sand paper across the blades to renew the edge. There are some good you-tube tutorials on this. 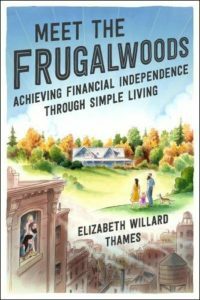 I always enjoy hearing all about your life, so beautifully written, and I enjoy reading and learning more about frugality. I am older, retired, and my needs are simple. Congratulations on your little family. I do enjoy the photographs you post as they are growing up. Best wishes from Australia. What a cute baby! Congrats to you, Mr. Frugalwoods, and big sister Babywoods! This is the first time I’ve left a reply on your site, although I’ve been reading it for a while now. I love checking in for new posts, as I find them very informative, uplifting, and just a tad autobiographical. It’s nice to see the pics of your family enjoying the frugal lifestyle! Thank you so much, Caroline :)! Next time you need a coffee maker, consider a Cuisinart. We’ve had our coffee maker for about 10 years now (where our previous coffee makers lasted only a year to only months). It has a mesh basket so you don’t need filters. My wife and myself finished your new book. We enjoyed it and are sending a copy through Amozon to our son and daughter in law in New Zealand! Great stuff!! Thank you! We take our trash and recycling to a designated transfer station once a week. And we buy special trash bags provided by the town (those are listed in a previous expense report). congrats on Littlewoods and Happy Birthday! I too am a fan of hand-me-down kids stuff. 80% of what we used for both of my kids during baby/toddler years was hand-me-down, and we still either use quite a bit of secondhand stuff, and also have multiple other families who now receive our hand-me-downs! We also do very little gift-giving in our household. Instead we spend money on things like private school for the kids, dance lessons, and music lessons—valuing experience and knowledge over stuff. Very cute baby!!! And very nice snow as well. I wish there was still so much snow here, but it’s been gone a while. I know not everyone likes snow, but I LOVE IT! I find I am all about embracing seasonal living – as long as its a season I like! We had a pretty pricey March, but it was because we were on vacation! We visited Texas and had a great time. There was also no snow, which was a bonus! Congrats on a nice March! Happy birthday! We also enjoy Worthy Burger…not too far from our NH location! That’s one very cute baby! Our March expenses were much higher than normal because we moved and decorated a new place. Things are coming back down to normal now. Awesome article. Recently read your book very thought-provoking thanks for all the great content. Makes me realise I’m spending a lot of money especially when compared to the FWs!! Thx again, Jason. Congratulations on the birth of your baby! I just got your book from the library and have almost finished it in 2 days (and as a homeschool mom of 3 kids, this is fast for me).